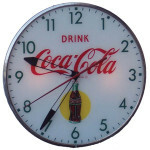 This antique advertising clock is promoting the classic Seven-Up brand. The clock is circular in shape. On the top is the brand name, “Seven-Up.” The orange “7-up” logo is printed on either side of the clock. 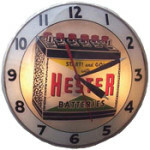 The clock features all twelve numbers, an hour hand, a minute hand, and a second hand.